Okay, let’s get this over with: Iceface. Feel better now? Because often, when I mention Whiteface to someone, they’ll roll their eyes and say Iceface in kind of a know-it-all way — even if they’ve never been there before. My advice: Get over it. 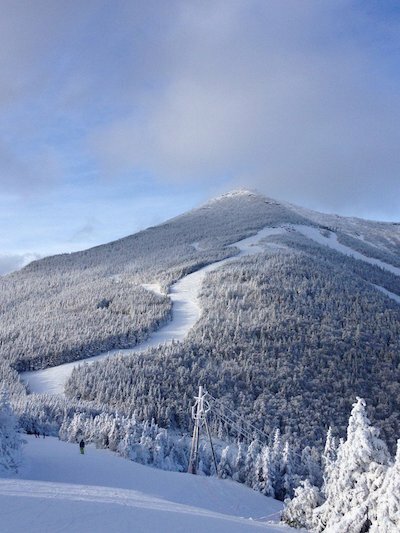 Because if you don’t, you’re missing out on one of the best skiing experiences in the East. IMHO, Iceface is a vestigial term, left from a time when there was little to no snowmaking or grooming and yeah, it was icy. 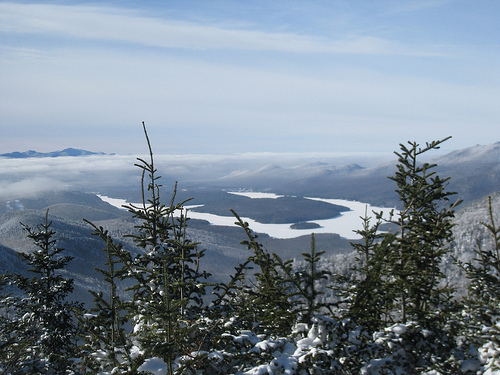 Whiteface is a high mountain that gets a lot of wind and weather. So I have no doubt that this was correct. But times change, and today, I don’t think Whiteface has any more or less ice than anyplace else in the East. Everyone gets their fair share. And there are ways to deal with it now that didn’t exist in the past. Instead, I’d like to start talking about just how awesome Whiteface is. Consider this: the Olympics were held there in 1980, and in nearby Lake Placid in 1932. A place has to be pretty special to have that happen. And Whiteface is. A couple weeks ago, Whiteface invited me and a bunch of other ski journalists for a ski media day. 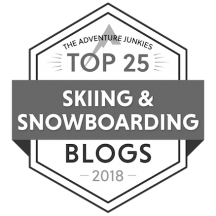 If you read my blog post about Okemo’s media day, then you know that this is a time that the resort people set aside to familiarize the press with all the stuff they have going on. You go on mountain tours, sit through presentations, eat at the various restaurants, and so on. It’s fun and you learn a lot. Suffice it to say that the one at Whiteface reminded me about why it’s a must-do in the East. Long, long trails: The highest lift at Whiteface unloads at 4,386 feet, a vertical drop of 3,166 feet to the base area, which sits at 1,220 feet. 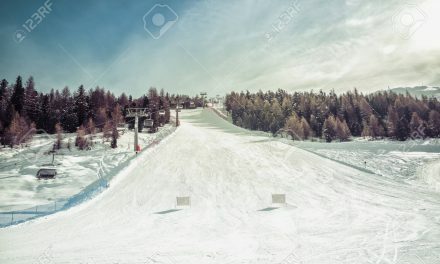 Its hike-to terrain, The Slides, is 264 feet higher (4,650 feet), giving Whiteface the greatest continuous vertical drop in the eastern US (3,430 feet). This makes for some very long, very fun runs. The Wilmington trail, for example, at 2-1/2 miles long, and is the East’s longest intermediate trail. Zoooooom. 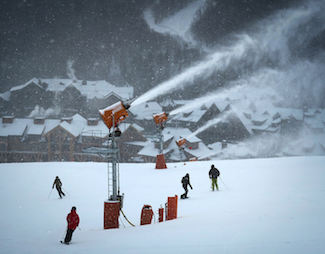 Snowmaking: Whiteface has come a long way in this department. The day of my visit, the guns were blasting everywhere. But what impressed me the most was the quality of the snowmaking system itself. 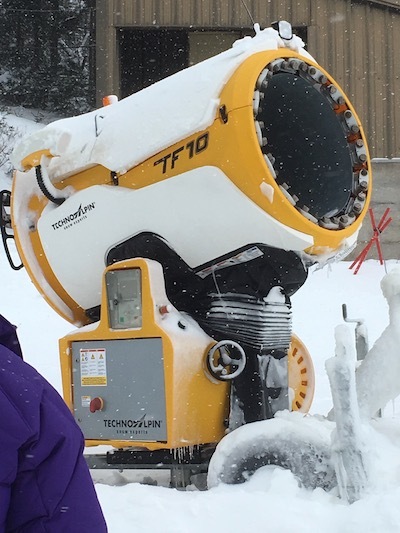 In addition to a hefty arsenal of snow guns that blanket 99% of the mountain with white goodness, Whiteface has 15 TecnoAlpin fan snow guns that are absolutely incredible. These energy-efficient guns produce snow that feels amazingly natural, without blasting your ears when you stop to talk or turning your goggles into a frosty nightmare when you ski past. They have an onboard weather center that tells them how much water to use based on wet-bulb temperature. And their basic operation (start, stop, snow quality and position) can be controlled from any computer or smart phone. Kids’ Program: Whiteface has an entire section of the mountain set aside just for kids/beginners — with its own lodge, dedicated trails, and lift. Which means you don’t get higher level skiers blasting through and creating problems for learners. Truly, it’s one of the nicest beginner areas I’ve ever seen. Lake Placid: There are ski towns and then there are Ski Towns. Lake Placid is the latter. It’s amazing. The spirit of the Olympics permeates the place. There are Olympic venues and training facilities everywhere. It’s like it took place last week. And there’s so much to do! 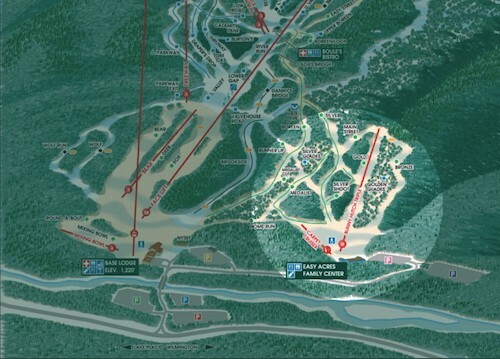 In addition to skiing, there’s ice-skating, tobogganing, the Olympic bobsled ride (DO IT! ), cross country skiing at the Olympic venue Mount Van Hovenberg. Plus there are lots of great shops, restaurants, and places to stay. 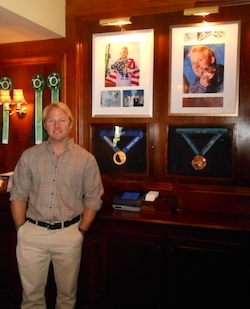 Which leads me to the following…..
Andrew Weibrecht stands by his Olympic medals at the front desk of the Mirror Lake Inn. 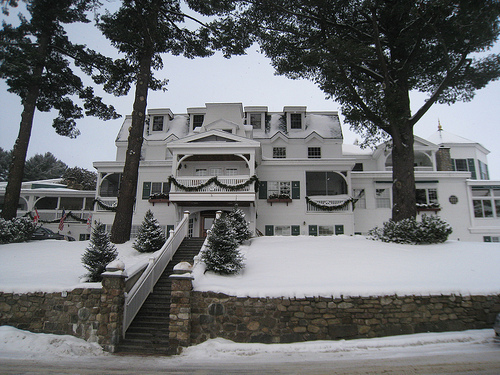 The Mirror Lake Inn: I can’t let this review go by without mentioning the Mirror Lake Inn, one of my very favorite places to stay, anywhere. 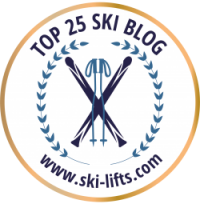 I actually nominated it for USAToday’s Ten Best Ski Hotels, and it came in fourth. With good reason. Owned and operated by Ed Weibrecht, father of two-time Olympic medalist Andrew Weibrecht, the Mirror Lake Inn is a gorgeous, rambling building on the edge of the lake. Decorated in a style I’d term elegant-Adirondack, the main building features a series of cozy sitting rooms with large, comfy chairs and sofas punctuated by huge, blazing fireplaces, a terrific restaurant, and bar. Downstairs, there’s a first-class spa, a hot tub, an indoor swimming pool, and a fitness center. No, this is not your Econo-Lodge. 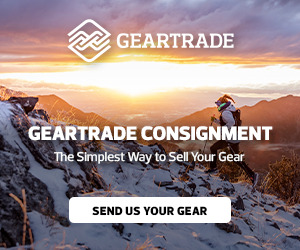 It’s pricey, but go ahead — treat yourself. It’s worth it. 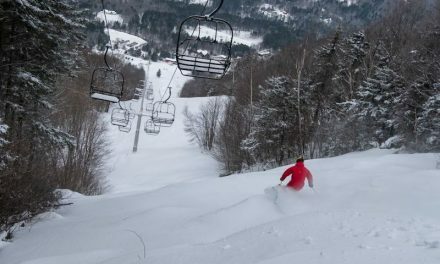 So should you go to Whiteface? By all means. And next time someone says Iceface and rolls their eyes, feel free to roll your eyes right back. Where have all the skiers gone? What’s new in Vermont for the ’14/’15 season. I’d recommend the Golden Arrow Resort as well, especially as the Mirror Lake Inn does not take pets, and our trip was enhanced by the company of our family member, Westie Jack. 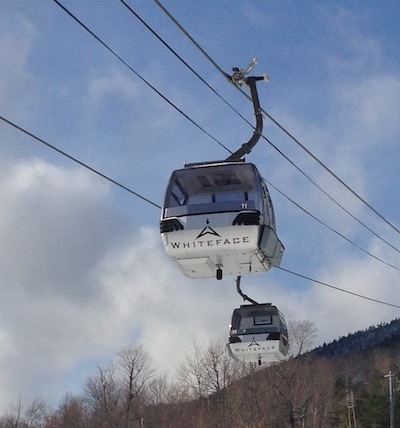 I reviewed Whiteface Mountain Skiing on TripAdvisor yesterday and agree with you about the misdeserved “Iceface” name. Wilmington Run was not open after Christmas but might be open now. 50% of the mountain was open 12/26-12/30. I recommend taking the Cloudspitter Gondola to the quad express to the top, which is actually 4,400 feet, according to the elevation on Apple iPhone – then taking the Follies down to the Parron’s Run or John’s Bypass to Victoria and Excelsior. For the casual skier I recommend taking the FaceLift to Easy Pass and Easy Way to Boreen – as a warmup and warm down.